11301 ft (3445 m) . 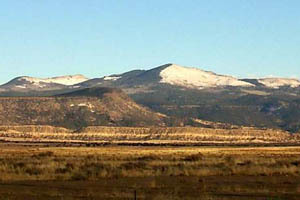 Mount Taylor is one the four sacred mountains of the Navajo, known to them as "Tsoodzil", the Blue Bead Mountain. The Spanish settlers named it "Cebolleta", or tender onion, and later San Mateo. Finally, US Army engineers named it for President Zachary Taylor in 1849. 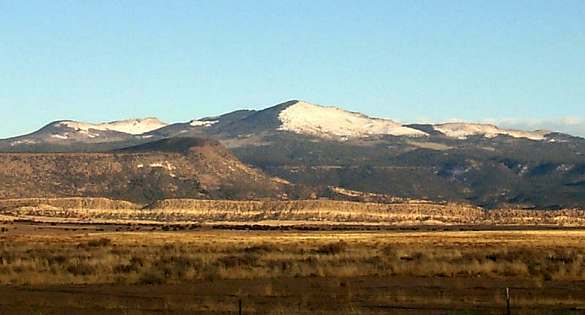 The mountain is a vast eroded volcanic massif which towers more than a mile above the desert plateau of central New Mexico. Most of its bulk was built during eruptions 2.5-3.3 million years ago, and it is now probably extinct. 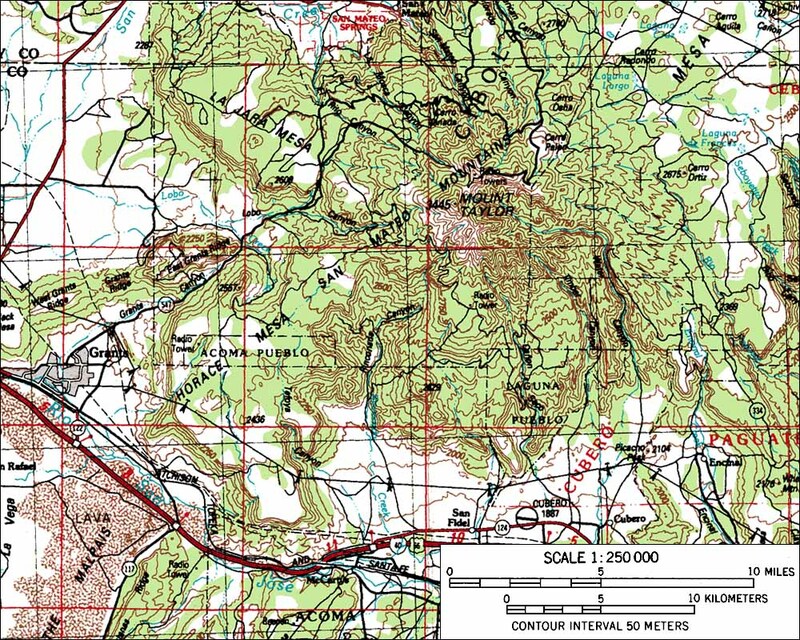 Erosion has since removed much of the cone, leaving several high points along three sides of a large east-facing valley (Water Canyon) where the original volcanic crater is believed to have been. 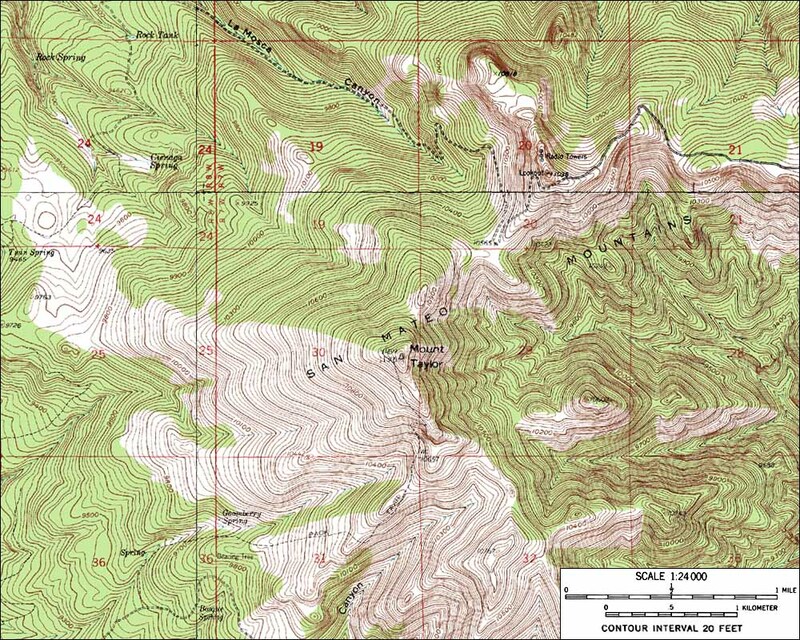 These high points include the 11301 ft summit of Mount Taylor and also 11036 ft La Mosca Peak, the site of a fire lookout. 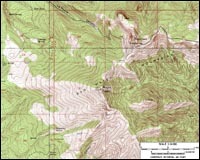 The best source of information about Mount Taylor and the surrounding area is the excellent book by Sherry Robinson, "El Malpais, Mt. Taylor, and the Zuni Mountains: A Hiking Guide and History". An interesting local event is the Mount Taylor Winter Quadrathlon (see link below), which is held every February. 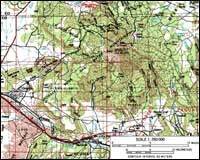 This race involves running, biking, cross-country skiing, and snowshoeing 22 miles from Grants, NM, to the summit of Mount Taylor, and then back down to town again.